Subscribers make the planet go ‘round. Today is Earth Day, and NASA wants to celebrate it with you. They want you take a picture of some natural wonder — a waterfall, animals in the wild, sunsets, the night sky — and post it on social media with the hashtag #PictureEarth. They’ll be posting photos as well, so keep up with the hashtag to see what everyone is doing. For more info go to NASA’s Earth Day 2019 site and see what’s what. Speaking of which, NASA has released a digital book called, simply, “earth”. It’s available in several formats, and it’s really quite beautiful. I read through it, and it’s full of wonderful images and information about our planet, broken up into several sections: atmosphere, water, land, and ice and snow. It’s chock full o’ staggering satellite images of our planet, each described briefly and simply by NASA scientists (like my friend Mike Carlowicz, who is the editor and one of the authors!). And oh, did I mention this is free? If you’re an American, your tax dollars already paid for it. Some people complain about paying taxes. When it comes to stuff like this, I think they’re wrong. This is a fantastic use of tax money. And if you’re an educator, I urge you to get your students to download it (or look at it on the website, which is also free, and has the complete book as well). This is a great way to inspire your students and show them just how beautiful their home planet is. Some good climate news for once: Vermont’s largest electricity provider, Green Mountain Power, will soon be living up to its name. They’ve announced they will go to 100% renewable sources by 2030. That’s very cool. I’ll note that nuclear, which accounts for just under 30% of their power, doesn’t count (legally) as renewable, though it’s carbon-free, and they’ll be transitioning away from nuclear over the next decade. They’re looking to increase solar, wind, and battery storage to achieve their goal. The linked article has more info. Many of the smaller producers in the state are already 100% renewable, which is nice. I’ll remind you that my own home town of Boulder, Colorado (kinda; I live well outside it but still in the county) has pledged to go 100% renewable by 2030 as well. It’s already on its way. I hope many other towns, cities, and states follow these leads. We can do this. In fact, researchers have shown how the whole world can go carbon-free by 2050, mostly by using solar and wind (as well as other carbon-neutral sources). Very importantly they also show how this will result in a net gain of jobs, despite the cries of doom and gloom by folks on the right. There is a vast amount of money to be made by phasing out fossil fuels and going green, and the sooner people realize that, the better. We really can do this. My friend Kim Boekbinder is a musician and artist, and something of a visionary. She loves to break boundaries and experiment with art. She put together an album of science-based music I did some consulting with her on, so trust me when I say I’m never quite sure what she’ll do next but I’m always looking forward to it. She’s been radio quite for a few weeks, and I’ve been curious what’s up. Then out of the blue, I see this appear in my social media, and it all becomes clear. Kim co-directed this, and it’s just wonderful: Representative Alexandria Ocasio-Cortez’s vision of future history, should the Green New Deal come to be. I love this. I think the art is great, and the message… well, it gave me a lump in my throat. A feeling of joy, of hope, of a future I want to see. Aside from the obvious message of how we can build our future by investing in green energy and infrastructure, there is the other message of representation, of showing kids who aren’t part of the white middle-class population that they matter, that their voices are important, and that they too are a part of all this and deserve their share of the future. I lived in that insulated bubble a long, long time, and when I stuck my head out of it I discovered a lot of viewpoints different from mine but no less valid than mine, and it was quite an eye-opener for me. A mind-opener. It made my universe richer and more interesting, and that’s why I advocate for that now. If I can listen and learn, than you can, too. I wonder if, in the very long run, that’s the more important message of that video. Once we fix our immediate problems — and we can — there will still be a lot out there. But if we approach all this the right way, why, they’ll be fixable, too. 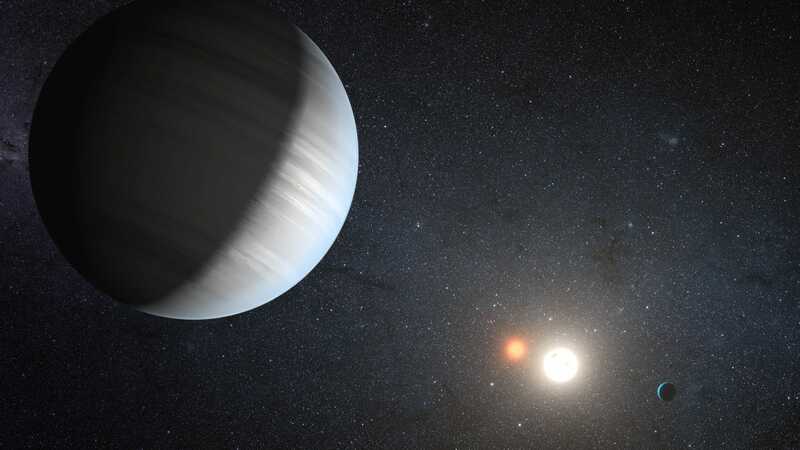 Tuesday April 16, 2019: TESS may have bagged its first Earth-sized exoplanet! 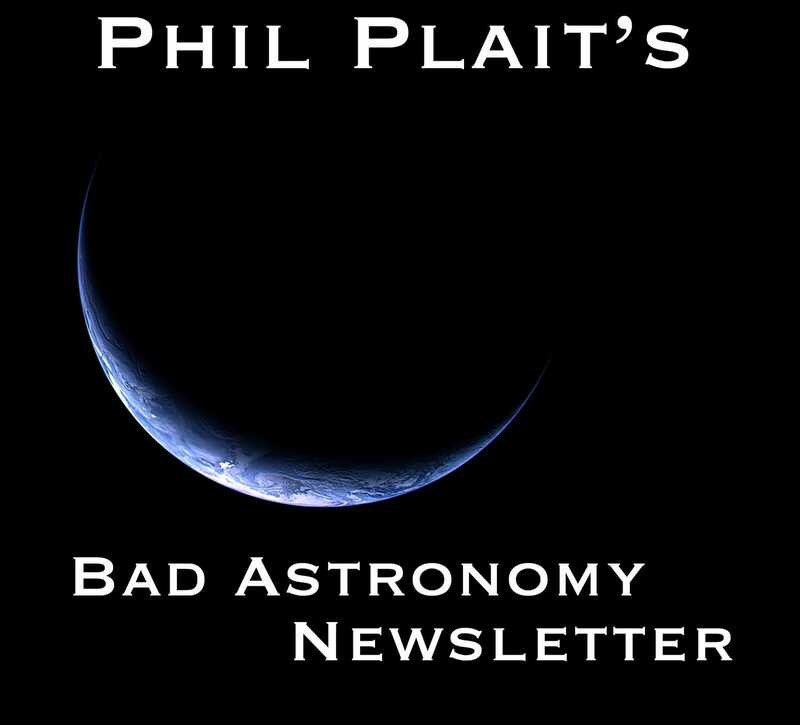 Wednesday April 17, 2019: How can you measure a star's size? Wait for an asteroid to block it. Subscribers dance among the stars. Hey, last week I asked if y’all could “like” the newsletter using the little heart icon at the top of the page, and holy wow did you come through! Thank you so much; it means a lot to me to get feedback — especially positive stuff, because duh — on this. 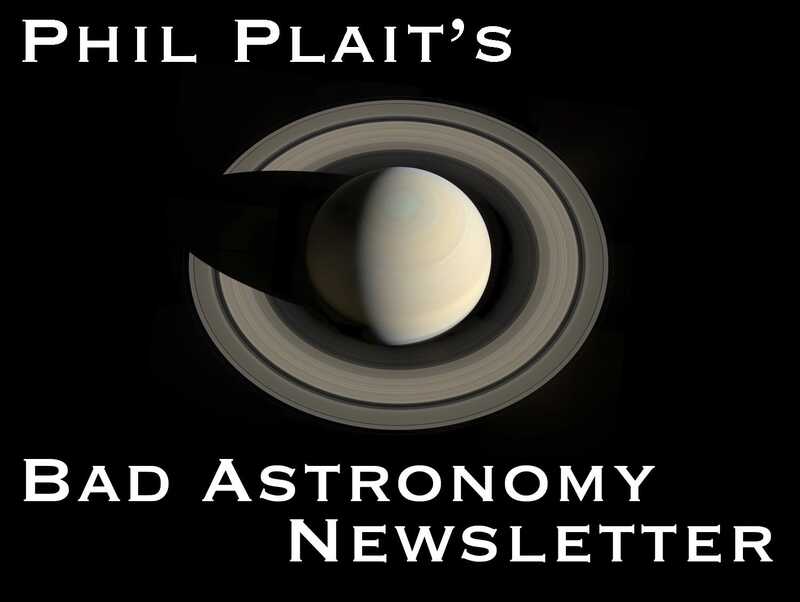 I hope you continue to enjoy the newsletter, and let me know what it is you like or don’t or what else you’d like to see. Thanks again! 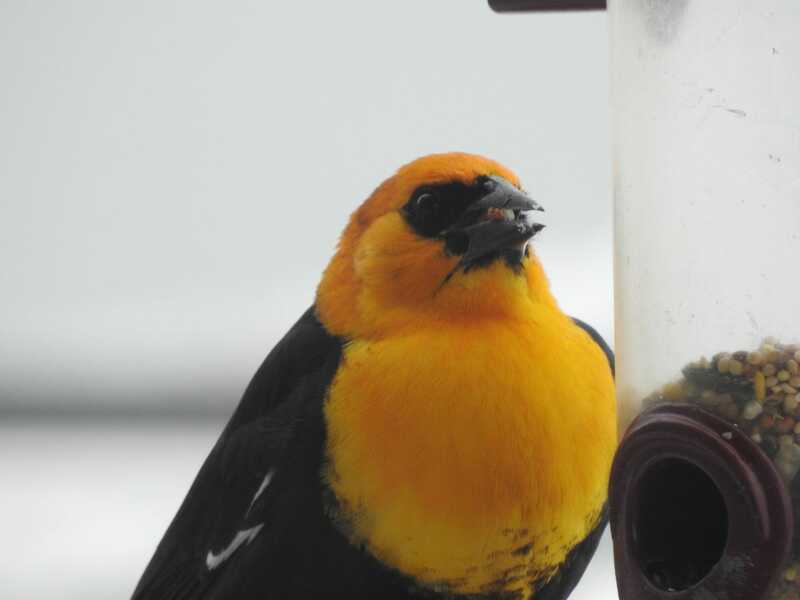 As a thank you, here is a photo I took of a new bird to me: a yellow-headed blackbird. I spotted this guy on a seed feeder my wife installed, and it turns out with a good telephoto you can get a decent shot from 3 meters away. :) I posted a couple of pix on Instagram and Twitter, but this is one only here on the newsletter. I saw this and I’m not sure what to make of it: French choreographer Kitsou Dubois is training dancers to perform their art in microgravity! This is a very interesting idea, and I wish the website had more information. I’d love to know when this is planned for, how they’re doing it (no doubt on board an airplane that makes a series of parabolic arcs to give passenger a few minutes of microgravity at a time), and how they’re training. I’d also like to know what music they’ll be dancing to. Clair de Lune, perhaps? Ah well. I’ll have to peek in on their Twitter feed every now and again to see if anything new has happened. I’d really like to see this when it’s done! This is a fascinating — and quite honestly tremendously exciting — stat: Solar and wind power have dropped in price so much that we could replace nearly 75% of all coal-fired power plants and immediately save money for consumers. For most of the U.S., just operating and maintaining coal plants is now more expensive than installing solar/wind from scratch. This comes from Energy Innovation Policy and Technology, and they have the references to back this claim up. They call it “coal cost crossover”, which makes sense. At that link they provide maps to show just where it would be cheaper to simply replace coal given the cost per kW, assuming you do so within 35 miles of a given coal plant. It’s amazing. Of course it’s not that simple. Deniers gonna deny, so there’s that, especially when these head-in-the-sand folks are politicians. But on a practical side wind and coal aren’t 100% reliable all the time, so there needs to be backup by other energy generation ideas (even using coal for that is not the worst idea, since it’s sporadic and less important every day). Energy storage is always the big speed bump, but batteries are getting more efficient and dropping in cost all the time. This comes at a time when Trump is loathsomely lying about wind power, too, intimating the noise causes cancer. My friend and climate scientist Michael Mann wrote an OpEd in Newsweek just tearing apart Trump’s vile lies about all this. You should read it. And also read this at Climate Nexus, about the health costs of fossil fuels. As usual, Trump’s lies are always projection; he attacks others for what he himself does (or his allies do). To end this on a better note, via my friend Zach Weinersmith, you can look at a site that tells you how well solar is doing in any state in the US. As you might think, with something 300+ sunny days a year, Colorado does very well indeed. We’re ranked 12th overall and 9th in growth. We also have lots of wind here, and sadly oil too. But I strongly suspect that soon, given all this, we’ll see fossil fuel use drop even more. I sure hope so. Subscribers get to see me rant even more. Hey! You! Yes, you, who is reading this right now. I have a very quick favor to ask, so quick that actually doing it will take less time than it takes you to read me asking you this favor. At the top of this post, right under the title, there is a series of icons. See ‘em there? If you liked this post, please click the little heart thingy. That helps me rise in the newsletter ranks at Substack, and that in turn helps more people find my newsletter. Also, if you think this article is something others will like to, then please share it! I have no problems whatsoever with you sending the free newsletter to other people via whatever other-people-sharing technique you want, including taking a picture of it on your phone, printing it, and sending it to your luddite relative who thinks the Internet is for commies or something. The same is true for the subscription-only Thursday issues, too, though I do ask you use your discretion and not just send the whole thing willy-nilly to the world. Duh. But letting others know about the BAN means more folks learn about astronomy and what’s going on in space, and that’s a good thing. Set your VCR! Or, if you’re living in the 21st century your DVR: On Tuesday night there’s a new episode of “Space’s Deepest Secrets” on The Science Channel, and you may see my face with words coming out of it. The episode is “Hunt for the Missing Moons” and it’s about the hunt for exoplanets with moons and rings and such. Check your local listings etc. usw. If you work at a museum or University or are the CEO of some giant corporation you’ll be pleased to know I will be happy to come to your establishment and give this (or one of many other talks) and all you have to do is give me some negotiated-upon amount of filthy lucre for it. My agent will be happy to talk to you; here’s my page on her site that has all the info you need. Thursday April 4, 2019: Wait. 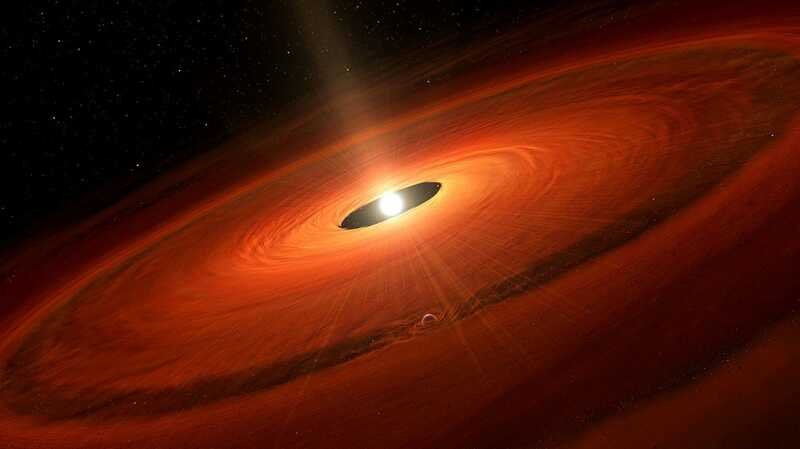 *HOW* fast do giant planets form? 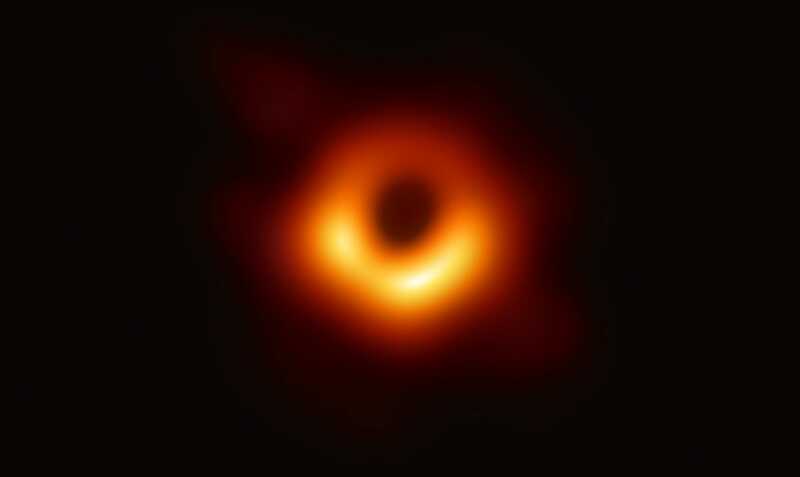 In case you don’t follow me on Twitter (or you missed it in between horse photos), I went into a tweetstorm about Thursday’s blog post on how fast a nearby exoplanet is forming. I wanted to bring the numbers into the realm of something graspable and wound up terrifying myself. It didn’t help that I did the tweeting on the fly, doing the math for each step and then tweeting, so the numbers were fresh in my head. Here’s the thread, for your amusement and/or brain-crushing realization that space is scary.